TAMING HUCK FINN, inspired by Mark Twain’s iconic adventurer, begins in the summer of 1870 in Atchison, Kansas, which served as a bustling port along the Missouri River. In those days, steamboats transported goods to settlements and army forts up and down the river, as well as hauling miners traveling to and from the Montana gold fields. Freedom-loving Huck Finn works as a part-time steamboat pilot when he’s not off searching for gold. The sprawling, unpredictable Missouri River provides the perfect landscape for my story about a restless man whose goal is to stay one step ahead of civilization. In those days, it took nerves of steel to pilot a steamboat on the wild, untamed Missouri River. A few of the things steamboat pilots encountered: elusive, ill-defined and ever-changing channels, getting stranded in low water, innumerable and often invisible snags, whirlpools, Indian attacks–to name but a few. 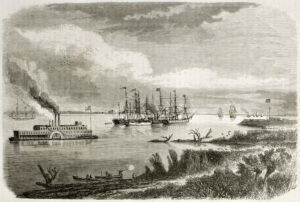 According to the U.S. Army Corps of Engineers, close to 300 steamboats went down in the river between 1830 and 1902. Historians estimate almost half of all the boats that plied the Missouri were lost to various accidents, with snags taking most of them to their watery grave. The “Muddy Mo” had a voracious appetite for steamboats! Near Kansas City, a construction company dug up a steamboat from the 1850s out of a farm field (the river had long since changed course). While there were no human casualties, the boat went down with its entire load of supplies. The Steamboat Arabia exhibit at the Kansas City riverfront is filled with some of the most well preserved displays of 19th century goods you’ll find anywhere. The type of boat Huck pilots is a “mountain boat.” These sternwheelers were smaller and lighter, equipped with spars, which were a bit like stilts to help the boat “walk” over obstacles. One of the best-known mountain boats was the Far West, piloted by Captain Grant Marsh. 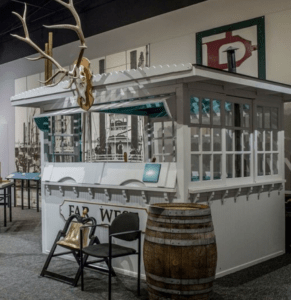 A replica of the Far West pilothouse shows a pair of antelope antlers mounted in front to indicate it was a “fast boat” — Grant made a record-breaking run down the Missouri River in 1876 after he picked up the wounded from the Battle of Little Big Horn. Packet steamboating on the Missouri River lasted from the 1820s to the 1880s, with the greatest period of activity between 1840 and 1860. The railroads contributed primarily to the demise of steamboat business by siphoning off long-haul passenger and freight business. 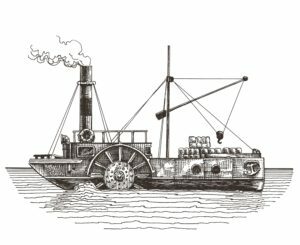 In 1867, there were 71 steamers regularly plying the Missouri River. Three years later there were only 9. (Wild River, Wooden Boats, Michael Gillespie, Heritage Press). Some of the landing points mentioned in Taming Huck Finn were busy ports in the 1870s: Weston, Missouri, Sioux City, Iowa, Fort Sully in the Dakota Territory, Kansas City, and eventually St. Louis, where the Missouri and Mississippi rivers converge. Steamboat pilot Huck Finn lives life on his own terms and steers clear of messy entanglements that might tie him down—until he takes charge of an orphaned boy that needs rescuing. Curling around, he squinted at the opening where his legs were exposed. Daylight outlined the figure of a child. Hopeful it was just a dream Huck shut his eyes. When he opened them again, the boy had bent to peer inside the barrel. Gap-toothed smile, snub nose, merry eyes that held the promise of mischief… “Tom?” Huck rasped. Huck rubbed his stinging eyes. He must’ve gotten ahold of some bad brew like the Fire Rod his old man used to swig by the jug full; that stuff made Pap see crazier things than a boy that wasn’t there. Uncle? Huck shook his head to clear it. By God, he’d swear off whiskey forever if it brought on these strange imaginings, and it had to be his imagination. Huck Finn weren’t nobody’s uncle. 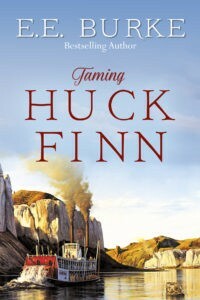 On April 1, I’ll be giving away an autographed copy of Taming Huck Finn in a random drawing from comments left on my blog. I’ve always wanted to go back in time and take a steamboat journey up the Missouri River. If yo Add Video Player u could travel in a time machine, what kind of adventure would you want to pursue? 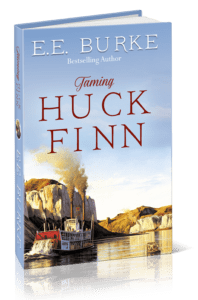 Steamboat pilot Huck Finn lives life on his own terms, steering clear of the kind of messy entanglements that would tie a man down–until he takes charge of an orphan and defies the “old maid” determined to raise him. What follows is a wild journey filled with humor, high jinx and heart-pounding danger, as a freedom-loving adventurer and an avowed spinster battle over the destiny of a young boy who is doing his level best to convince them they belong together. It didn’t seem a far stretch to imagine Huck growing up to be a steamboat pilot. He was a child of the river, and I couldn’t see him straying far. Plus, he had the intelligence and temperament to pilot steamboats, which requires a unique combination of skills, instinct, excellent reflexes, and steely nerve. 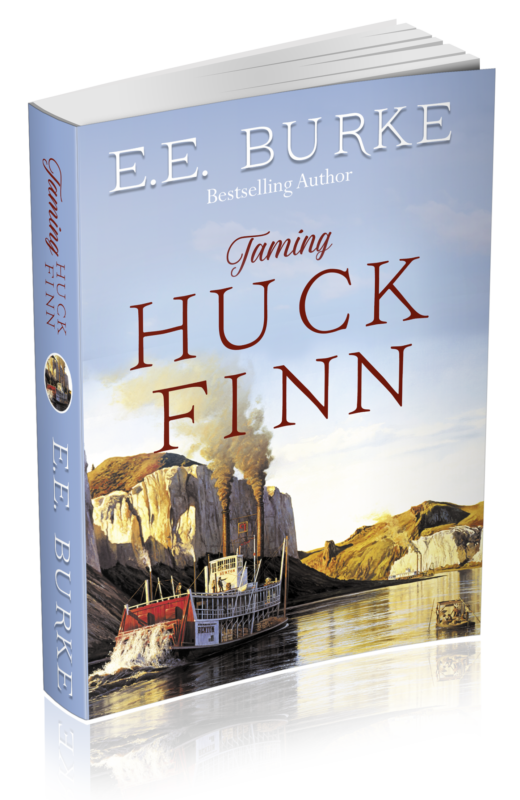 Of course, I couldn’t write a book about Huck being a steamboat pilot without referring to Mark Twain’s Life On The Mississippi, which is largely based on Samuel Clemens own apprenticeship as a riverboat pilot. Reading the diaries of Missouri River pilots helped me place Huck on a different river, one that I think it fits his personality. 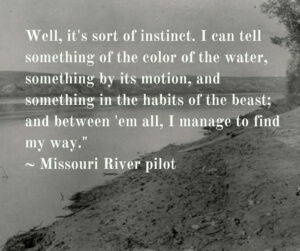 In Taming Huck Finn, as in Twain’s original book, the river itself is a character. The Missouri River of today is nothing like what it was at the time of Huck’s story (1870). Before being dredged and tamed by the Army Corps of Engineers in the early 20th century, the “Big Muddy” was sprawling and unpredictable. I have a map that shows where steamboats sank along the old path of the river, and it is littered with wrecks. Taking a steamboat on the Missouri River was a dangerous undertaking, especially into the north part of the river where it was shallower and rocky and prone to flooding. Just the kind of challenge Huck Finn would relish. 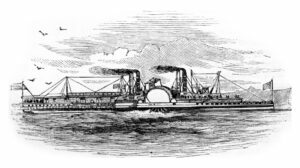 During this same time, the era of the steamboat was giving way to the steady advancement of the railroads. Huck sees himself, the old boats and even the river, as relics of a past that is quickly fading. He’s struggling to figure out how he fits into a new world rapidly catching up with him. Does he keep running? Or does he risk his freedom for the one thing that’s eluded him all these years?